You’d think that any floor would do for a home office but there are some unique challenges to keep in mind. 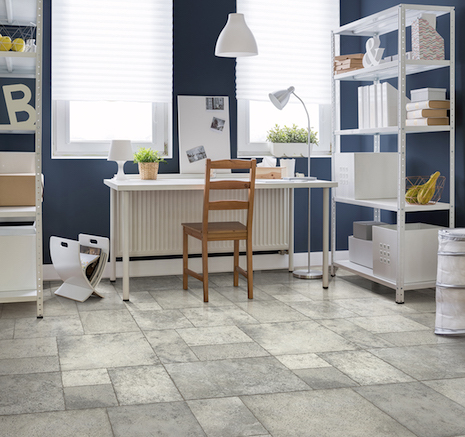 Based on performance alone, luxury vinyl - tile, plank, WPC or rigid core - is my top choice. Built to stand up to the abuse you can even opt for commercial grade flooring which offers a higher level of protection. Look for wear layers of 20 mils and higher. The good news is that upgrading to commercial quality goods for a small home office space won't cost that much more and is well worth the extra expense. And don't worry about styling -- you'll find plenty of options and visuals to choose from. Laminate is my number two choice because it too is built for performance. Laminate styling is fantastic, especially at the higher end, and is well worth the extra expense. Laminate's one drawback is that it can be loud -- a sound dampening underlayment is highly recommended. Carpet is a great choice but cut pile carpet doesn't stand a chance against rolling office chairs. That's why most commercial office spaces select low pile level loops that can stand up to higher traffic (and rolling chairs). Carpet’s sound dampening qualities may not matter as much in a home office setting but it’s still a nice feature you’ll come to appreciate. The styling options for commercial look carpet are also much broader than we’re seeing in residential settings. Carpet tile is a fantastic option – maybe even the best carpet option – for those who do not want ugly floor protectors – the ability to replace single squares one at a time means you can skip the ugly floor mat. Hardwood can also work but floor protection is definitely required. If you’re looking to impress customers, there may be no better choice than hardwood. Get yourself an area rug to go with it (unless your home office is as tiny as mine is). 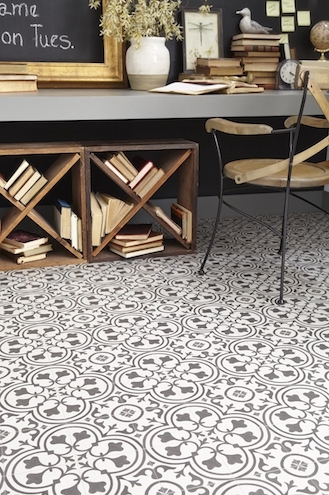 Ceramic tile is a great choice. As one of the most versatile floors in that it can give you customized looks and all the performance you need.